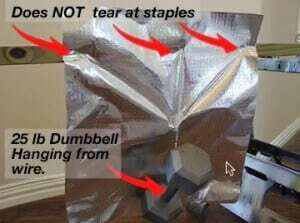 Home › How Strong is AtticFoil™? Our foil products will not rip, tear or shred – they are strong! Radiant barrier insulation is a reflective insulation system that offers a permanent way to reduce energy costs. Radiant barrier insulation reflects radiant heat energy instead of trying to absorb it. A pure aluminum radiant barrier will reflect over 97% of the radiant heat entering your attic and then your living area. If you are shopping for foil, you might notice that vendors call the product many different names. For example, one vendor labels their 13lb product as premium. Here is a little secret: the aluminum products all have the same 99% pure aluminium foil on either side. The main difference is the inner layer between the aluminum, the scrim. The heavier the scrim, the stronger the foil; don’t be fooled by the name, go by the weight of the product. The weight reveals how strong the product is and for an application that will require pulling, tugging, stapling, cutting, etc. you don’t want to bother messing with a lightweight product; the only thing it will offer you is a headache. We only sell the heavyweight foil insulation. The photo to the right was a little experiment set up just to show how strong the foil is. In the experiment, the foil is stapled on the 2×4 board with just three staples. Then, a 25lb dumbbell was hung with a coat hanger through the middle of the foil. The staples held the dumbbell and the hole with the coat hanger barely stretched. What does this mean? It means that even though our product can easily be cut with a knife, once it is in place it will not tear, rip or sag. You can staple one end, pull the foil across a section, staple the other end, and then fill in the install with just a few more staples. This equates to a faster, virtually hassle-free installation. This product will never sag or fall down due to age and/or windy conditions, this product is made to last. 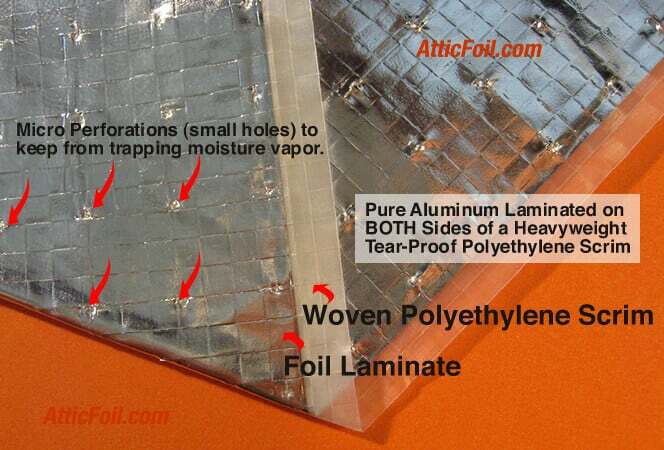 This is not kitchen foil; kitchen foil is thin and will tear very easily if applied in an attic and some kitchen foil is not pure aluminum, AtticFoil™ is 99.5% pure aluminum. This is the best radiant barrier you can buy.